COOL CURLING — Arizona’s Coyotes Curling Club has the perfect getaway from the summer heat: the Alltel Ice Den for a summer curling league. If you are interested in learning this cool sport, which is growing in popularity in the Valley, contact the skip@coyotescurling.com. 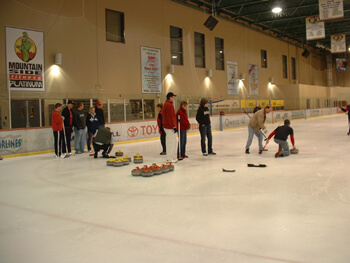 First, we are happy to let you know we will be holding another Learn-To-Curl Sunday, April 18 from 1 p.m.-3:30 p.m. The timing of this couldn’t be better! Here’s why — we are also pleased to announce we are going to have a mini-summer league in your honor! That’s right, below are possible dates, of which we will pick six, to create a beginner/fun league for you. This league is open to all ages and abilities. If you’re new and want to learn more about curling, this league is for you! If you’re a member already and just want to hone your skills, this league is for you! Here is the catch. In order to confirm the Mini League with the Alltel Ice Den, we need 40 commitments for the league. We have had a number of entries submitted, but we still have many spots open. Although the deadline for commitment has passed, if you are still interested, please contact the Coyotes Curling Club. The cost per person for the six-week league will be roughly $125. Once we can confirm the actual cost of the ice, we can give you the exact rate, but I believe this rate will be close. New curlers wishing to join the summer league will be given priority in the Learn to Curl. Saturday, May 2: 7-9 p.m.
Saturday, May 8: 7:30-9:30 p.m.
Saturday, May 15: 7-9 p.m.
Saturday, May 22: 8:30-10:30 p.m.
Saturday, June 5: 8:30-10:30 p.m.
Sunday, June 13: 5:30-7:30 p.m.
Saturday: June 19: 5-7 p.m.